"I was eventually diagnosed Bowel cancer last October. Treatment was delayed due to other health problems, probably side effects of the cancer. I was admitted as an emergency in January 2017 to have my bowel surgery by which time I had lost 30kgs in weight. "I needed advice and support and have found the support of Bowel Cancer UK and their mad followers on Twitter so supportive. Bowel Cancer UK has been so supportive with positive social networking and introducing me to so many fab and supportive people many of whom are going through the same as me. "My cancer has spread to become peritoneal disease but at the moment my chemo is keeping it in check. 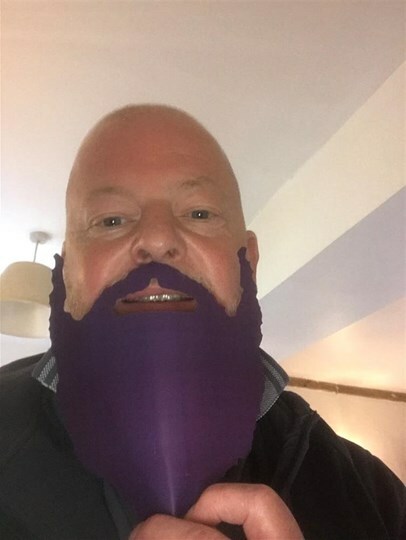 In December I will complete 12 months of chemo, so I will not be shaving and re growing my beard (it would take too long due to chemo) but I will be aiming for a range of colours throughout the month for your delectation. "Thanks to all at Bowel Cancer UK, you are fab!" Bowel cancer remains the second biggest cancer killer in the UK, but it shouldn’t be. It’s treatable and curable especially if diagnosed early. We’re calling on dads, brothers, sons, nephews, grandads and uncles to grow a beard this December to raise awareness and money to support vital research and lifesaving work. Sign up and give hope to those that are going through treatment, remember loved ones and come together to stop bowel cancer.